Using a 6.4mm straight cutter and fence, a front face slot is carefully machined to a depth of about 10mm. 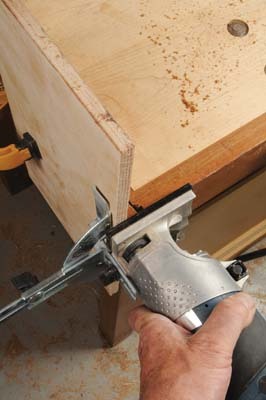 The cutter is just wide enough to remove the wavy path of the errant jigsaw kerf. 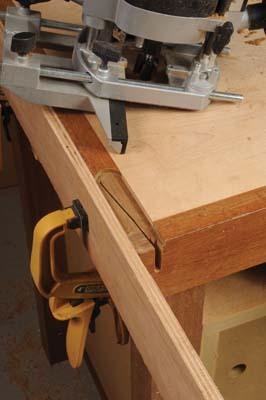 Note the all-important extended running surface clamped to the bench end for the fence to slide against. A similar operation takes place on the top surface using a 19mm straight cutter to cleanly remove all of the damaged solid lipping. Again there is an extended running surface for the fence. At the front a waste piece (removed in the photo for clarity) was used to prevent breakout as the cutter exits the lipping. 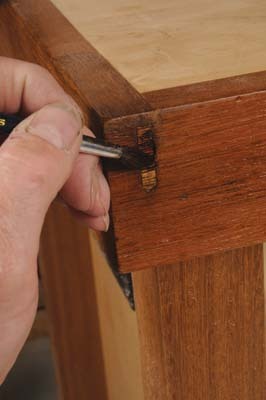 An accurately cut short grain section of matching timber is glued in the slot. The lipping is made of teak, which is oily, so it was necessary to clean the gluing surfaces with methylated spirits to degrease them first. 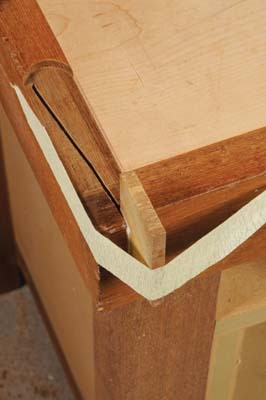 Note the bottom end is rounded to fit the routed slot. 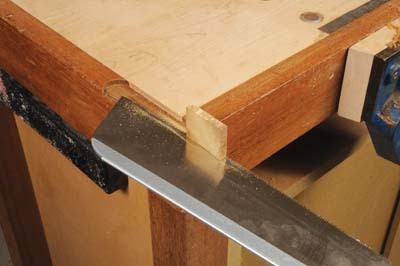 The waste is trimmed off flush in both planes with a fine tooth saw. The top surface of the infill needed to be absolutely flush with the routed recess so that the top infill patch can lie level. 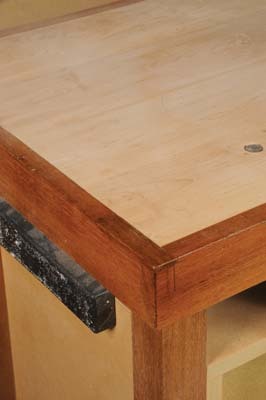 For the top patch, the bench surface was slightly uneven so to avoid planing it flush and breaking through the darker surface of the original teak, I gently crushed the fibres down at the end of the patch with a hammer... an old restorerâ€™s trick. The end was carefully rounded to fit the routed recess for a neat effect. The patch was glued and taped in place, and later trimmed. There was still a slight colour mismatch so with the use of the appropriate dyes, I darkened the patch to get a reasonable match. And there we are... jobs a good un. Obviously the patch is not perfect, but was a lot easier to do than taking off the bench lippings and fixing new ones. 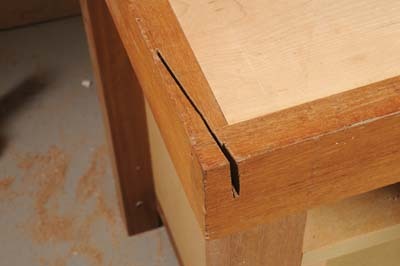 I dare say eventually the bench will be fixed this way after a few more mishaps but, for now, this fix is good enough. Erm, we've all done it, accidentally attacking the thing we care about most... our prized workbench. 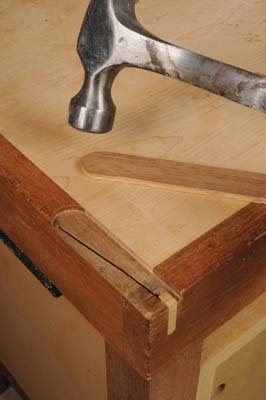 In this case, the culprit was a jigsaw and trammel arm with NO sacrificial board underneath. As a result, it wasn't even a straight slot that had to be filled! Here is how we went about fixing it.